Mousepup wrote: I don't know how "so sure" is, but I did not mean to suggest that there's perfect shade anywhere, just that it has to create relative shade for some volumes somewhere in order to concentrate radiation anywhere else- which sounds kinda dumb when I put it that way, but... uh, yeah. No, that's not dumb. There's a finite amount of energy. If it's getting concentrated anywhere, it has to be more diffuse somewhere else. Mousepup wrote: I was also picturing things kinda backwards. Relative to David's plot there, I was imagining putting the lens closer to the source, so the beam-side focal point is farther away instead: the red region is about where I was imagining the source, so the beam on the far side is much more elongated. If it helps, I only pictured it that wacky way because I was kinda starting from the mental image of a cylindrical beam setup as described upthread, not for any sane reason. Well, maybe I should have labeled things. In my conception of it, the supernova is waaaay out to the left of the picture, and the black dot is the black hole. Energy is propagating from left to right. The red zone is the concentrated/focused area while the green zone is the area that's "safer"; yellow represents largely unchanged concentration. gmalivuk wrote: Radiation from more angles doesn't mean more radiation, though. This is true. I'm basing my opining here on intuition. You're going from laminar flow of radiation to cross-flow, but the radiation is being stretched in multiple directions. I'd have to do math. Ugh. I'm going to have to do this, I just know it. Can't get it out of me noggin. But yeah, as Mousepup's point is exactly right in any case. Even if it requires complicated math to determine exactly where the radiation is stronger or weaker, there is the unavoidable fact of energy conservation, which implies that making it stronger in one place makes it weaker in another. And since a nonzero fraction of EM and charged particle radiation must fall into the black hole itself and be lost to the rest of the universe, that also proves some places end up with less radiation than they would otherwise have gotten. You know, it might actually be better to be anywhere on the opposite side from the black hole. I would predict that the radiation you get hit with increases the closer you get to the black hole. The one factor which might make a difference would be the size of the Schwarzchild radius in comparison to the distance from the 'nova -- if the black hole was REALLY large and REALLY close then there might be a small pocket of protected space right behind it. It would seem that there's a triangular extinction gradient once you get sufficiently far away. Yeah, and such a zone makes sense given how gravitational lenses are different from refractive and reflective ones. The focal point of light that curves around the black hole depends on how close to the hole it gets. Photons that pass relatively close are diverted a lot and focus relatively close to the black hole. Photons that pass by farther away are diverted less and focus far from the black hole. Beyond a certain angle, which I could calculate but don't care enough to do so, the photons don't reconverge at all. Whoops, pardon my language! I meant "obvious," as opposed to "incorrect." Also, the first diagram is fine, I just meant that I was picturing something different earlier. That's a good point about gravity lenses being unlike any mundane optics; the more familiar geometry I was picturing is ...structurally different, I guess. Those paths are not easy to imagine several of at once, so I fear that constructed diagrams are the most practical way to visualise the interaction. To construct the diagram, you just draw a bunch of open orbits around the black hole which also intersect the radiation source, right? I'm enjoying how the perigee's location varies with the axis of the parabola, it looks like a softened heart shape, but don't know if that's a useful stepping stone toward being able to visualise the radiation field. I think I'm gonna be losing sleep for a while, but thank you for this. What are the characteristics of a photon's orbit around a black hole? Is it necessarily parabolic? Hyperbolic? I'm thinking that perhaps there is no safe point immediately behind the black hole at all. And it's possible that even if the focusing diverges, it's always stronger than the background inverse-squared extinction would have been. We ought to collapse it to the one-dimensional case; we won't see the focusing effect so clearly, but it can give us a better idea of what the possible curves might look like. After all, that's what we want to know -- where are the minimums and maximums and relative heights of the curves along that one-dimensional line? Ooh, found a diagram of wave propagation around a black hole. In this example, the radius of the black hole is obviously very large compared to the distance from the point source, but I don't think it matters. Apparently the lens focuses waves most strongly immediately behind itself, and the focusing continues outward to infinity but decreases with distance. I don't think there's any point behind a black hole where it is less focused than it would be if there was no black hole there. This matches my original mind's eye, but I'm not certain anymore. I need to write something 3D in Java with ray tracing to satisfy myself, and my defense on Friday kind of takes priority. Also remind me if I forget in a week. The drugs I am on give me the memory of a ferret with Alzheimer Disease. Also, my last reply was before I saw all the cool stuff you guys had just posted. Carry on. davidstarlingm wrote: Ooh, found a diagram of wave propagation around a black hole. As long as you're outside the photon sphere, the photon sphere itself appears to be the black hole. Black holes actually look bigger than they are because the only light you can see past the photon sphere is light which was emitted from inside the photon sphere (like reflected light from an object that is falling in). When you hit the photon sphere the black hole appears to bisect the universe in half, and once you hit the event horizon (which you can't, objectively speaking) the rest of the universe is but a single point of light. So in any of those diagrams, keep in mind the black hole as we would observe it seems to be larger than it actually is by a significant amount. Drawing the photon sphere with a dotted line might reveal some obvious boundary points (perhaps). For a given black hole mass and distance from the primary, the deflection angle for the asymptote will be some function of the initial emission angle relative to the line connecting the primary and the black hole. If we can determine that equation, we can produce a simplified ray-tracing diagram to characterize the overall focusing, then draw in the Schwarzchild radius and photon sphere to see what extinction (if any) is produced. Unfortunately, I'm having trouble coming up with that equation. Any idea how to determine the deflection angle of a photon going around a black hole of a given mass with a particular distance and so forth? Last edited by eran_rathan on Tue Dec 10, 2013 7:55 pm UTC, edited 1 time in total. Better correct your open quote there. So I'm guessing θ is given in radians? The page says it can be simplified to 2rs/r, where rs is the Schwarzchild radius. But what is r? Is that the nearest approach made by the photon to the black hole? The shortest distance between the undeflected trajectory and the black hole? davidstarlingm wrote: Better correct your open quote there. r2 = r1-τ, rinse and repeat. I know there is an easier (functional) way of doing it, but I'm at work and can't really think. And that θ is almost certainly radians, given SI units for everything else. EDIT: that isn't right, there's some weirdness going on from general relativity, but I can't ferret it out right this moment. I'll suss it out later. davidstarlingm wrote: So I'm guessing θ is given in radians? The page says it can be simplified to 2rs/r, where rs is the Schwarzchild radius. But what is r? Is that the nearest approach made by the photon to the black hole? The shortest distance between the undeflected trajectory and the black hole? Without digging deeper, my guess is that the function is at any given time, r should equal the current distance between the particle and the Schwartzchild radius. To get the hyperbolic or spiral curves, the function would need to be looped. Eh, it looks like it's the total deflection between the asymptotes of the hyperbolic orbit section. Time-independent. Orbits around black holes are not conic sections, because that's just what happens in the Newtonian limit. For an easy demonstration of this, remember that orbits around black holes can circle any number of times before escaping back out to infinity, and this includes orbits of photons. For the same reason, I have to suspect that the above equation is only an approximation, which gets less accurate the closer you get to the black hole, where it should diverge to infinity as you get to the photon sphere's radius (r=1.5rs). Edit: also, the more useful diagram would be ray deflection around a black hole, since the waves don't give any indication of the flux at any point, while the density of rays would do so. Found this lovely bit. Apparently someone has done some extensive work on this already. You can see how the photosphere is formed well outside the actual event horizon. So I'm not sure it ever diverges on the right-hand side. A focusing effect may extend to infinity. And getting closer to the photosphere certainly isn't going to help you at all. The actual page is here. A similar discussion is here. But the lines are clearly farther apart on the right than on the left of the BH, which to me suggests that photon flux is lower there than it would be if the BH was absent. Douglas Adams wrote: A neutrino is not a big thing to be hit by. In fact it's hard to think of anything much smaller by which one could reasonably hope to be hit. And it's not as if being hit by neutrinos was in itself a particularly unusual event for something the size of the Earth. Far from it. It would be an unusual nanosecond in which the Earth was not hit by several billion passing neutrinos. It all depends on what you mean by `hit', of course, seeing as matter consists almost entirely of nothing at all. The chances of a neutrino actually hitting something as it travels through all this howling emptiness are roughly comparable to that of dropping a ball bearing at random from a cruising 747 and hitting, say, an egg sandwich. Hmm. It may be that I'm seeing where the lines cross and assuming it means they're focusing, when it's really more like a scattering effect. Just because they are crossing in a symmetric fashion doesn't mean they're being focused at all. Within a certain radius, all light is absorbed. Within a slightly larger radius, some light is absorbed, some light is backscattered, and some light is bent. Within an even larger radius, light is mostly just bent at random angles. So maybe the black hole DOES reduce flux after all. 0) While it is true that the closer you get, the more wrapped-around-and-wonky the radial lines become, those also become a vanishingly small proportion of the overall radiation if you focus on them too much. You really need to make a spherical target and take the average exposure after a monte carlo run of possible traces to approach a likely answer with estimations that can be cross-checked for accuracy (to at the very least reduce alpha for simple hypothesis testing). 1) I am yet unconvinced that the three-dimensional model would follow from the two-dimensional one for the purpose of determining energy density. Circles and spheres are very different beasts, not to mention what happens when you add the +1 time dimension into the manifold (which I am still hopeful can be fudged around if we treat hot particles as similar to light for the most part). Anyone know the equation for the trajectory of a photon with arbitrary direction, given a black hole of specified size and distance from the primary? That would be the first step in setting up a proper Monte Carlo. Trickster wrote: I am yet unconvinced that the three-dimensional model would follow from the two-dimensional one for the purpose of determining energy density. Circles and spheres are very different beasts, not to mention what happens when you add the +1 time dimension into the manifold (which I am still hopeful can be fudged around if we treat hot particles as similar to light for the most part). Well, I daresay the gamma ray blast from a supernova would quite definitely fry you long before you'd get hit with any neutrinos at all, so unless we only want to see cases with a shield-from-everything-but-neutrinos, using photons as our test particles should be fine. Besides....correct me if I'm wrong, but the interaction between a photon and a black hole of mass M should be about the same as the interaction between a neutrino with velocity 0.9c and a black hole of mass 1.1M, right? It would just be an essentially larger event horizon and larger photon sphere. Last edited by davidstarlingm on Thu Dec 12, 2013 3:57 pm UTC, edited 2 times in total. davidstarlingm wrote: Anyone know the equation for the trajectory of a photon with arbitrary direction, given a black hole of specified size and distance from the primary? That would be the first step in setting up a proper Monte Carlo. that level of math is, unfortunately, well outside my pay grade. What we really want, ideally, is a three-dimensional contour plot showing the photon flux at every point in the two-dimensional ecliptic plane. To get it accurately, we'd need to give that plane some unit thickness and quantize it to a series of cubes. Then, we'd need to produce a list of black-hole-affected trajectories for a random series of rays coming out of the supernova origin (being careful not to bias this with clustering around the poles). Finally, we'd want each cube to run a check for intersection with the trajectory of every ray in our list and assign the number of intersections to its xy coordinates to give us the flux density plot. Then condense that whole process into a program which will produce the plot for any arbitrarily-sized and arbitrarily-located black hole. Arguably, there's radial symmetry around the line connecting the black hole and supernova (if we ignore the effects of mutual orbit and so forth). The null geodesic trajectory of a given ray depends only on the azimuthal angle of the initial ray vector. But this only helps us in producing the initial list of trajectory equations; I think we'll still need to use a three-dimensional treatment in order to get a good idea of flux via the intersection approach. Finally, this whole thing assumes a time-independent flux, which may not be the case. Is the peak power output of a supernova constant for long enough to produce a time-independent flux for this system? Surely the equation of the null geodesic trajectory around a black hole has been derived in plenty of places, no? Photons are only following the shape of space, after all; it's not they have rest mass to deal with. EDIT: This assumes a Schwarzchild black hole, of course; a Kerr black hole is going to introduce all manner of nasty interactions from frame-dragging, particularly if the damn thing has a rotational axis not normal to the ecliptic. Then again, a proper rotation could theoretically cause constructive interference within the spherical orbit itself like the pumping mechanism in lasing fluorescent microspheres. Possibly a workable supernova laser? 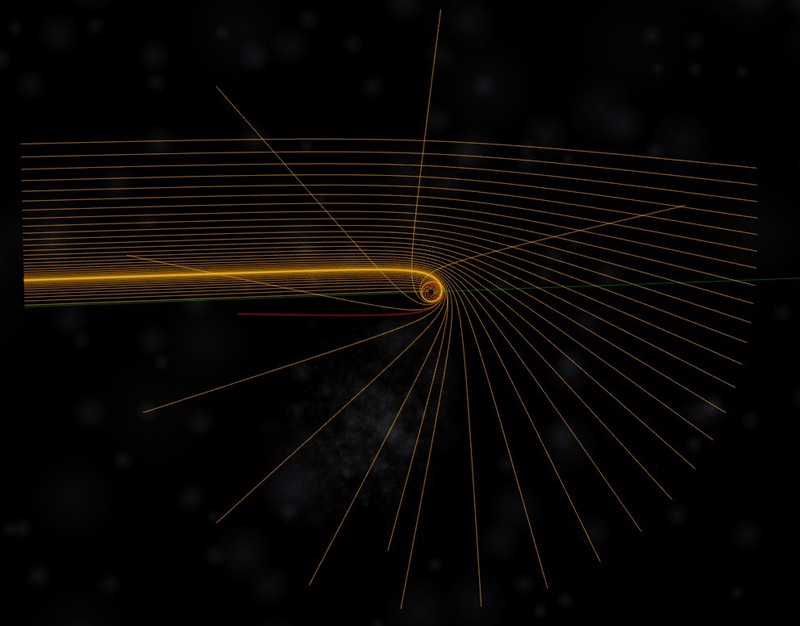 ANOTHER EDIT: I'm not running a Mac, but apparently this dude developed a calculator to determine the trajectory of photons around a black hole last month. Any possible use? You are all basically reinventing gravitational lensing. Most lensing is "weak field" even around black holes. Let d_s be the distance to the source (from the observer) and d_l be the distance to the lens (from the observer.) put the lens at the origin of your coordinates. then set s to be the position in the source plane of the source, so that y = s/d_s be the angular displacement of the source from the line of sight through the lens. Let M be the mass of the lens. Let m=M*(d_l * (d_s-d_l) * 4Pi * G) /(d_s*c^2) be the reduced mass. Then the angular Eintein radius is Theta_E=sqrt(M/(Pi * d_l^2) ) . Then u=y/Theta_E is the angular displacement in terms of the Einstein radius. Then a point source at angular position y will have maginification mu = (u^2+2)/(u(sqrt(u^2+4)). So yes a point source directly in the line of sight will have infinite maginification, but if we integrate around a disk of angular radius delta (in Theta_E units) we get an average maginification of sqrt(d^2+4)/d. Which looks like we can make it as large as we want by making the source smaller and smaller angularly, however, that also increases the distance to the source and thus decreases its brightness pre-magnification. If you wanted to find out the maximum magnification you could achieve, you would have to redimensionalize the problem and chase through the effects of varying d_L while keeping M and d_S constant. There is no closed-form equation for the trajectories, so it'd all need to be done numerically. But all the 3d precision and such people are discussing isn't necessary for the original question of *whether* you could take shelter behind a black hole from a radiative event on the other side. Two dimensions are sufficient for this (if we ignore the relative motion of the BH and SN), because higher or lower flux through a line segment corresponds to higher or lower flux through the corresponding area in the 3D case, at least for radially symmetric configurations about the SN-BH axis. So we should still be able to map out the regions of higher and lower radiation just fine. Last edited by gmalivuk on Thu Dec 12, 2013 7:42 pm UTC, edited 1 time in total. Yeah, I'm not sure whether specific magnification is the factor we're really interested in. Of course, if there WAS a protected zone along this axis, the 2d case could still be interesting. Just to see whether the protected zone was bounded by regions of higher intensity or whatever. Magnification is actually what you care about. Given that surface brightness is convserved, magnification directly translates into flux. The formula I gave for magnification: sqrt(d^2+4)/d is always greater than 1. Being behind the black hole is always worse, unless you are really close to the black hole, so that the weak feild approximation is off. I would guess you probably have to be within a few radii. Nicias wrote: Magnification is actually what you care about. Given that surface brightness is convserved, magnification directly translates into flux. The formula I gave for magnification: sqrt(d^2+4)/d is always greater than 1. Being behind the black hole is always worse, unless you are really close to the black hole, so that the weak feild approximation is off. I would guess you probably have to be within a few radii. So are you saying that within the weak field approximation, magnification behind the black hole is a constant -- that it's always just some multiple of the original inverse-squared function? Nicias wrote: You are all basically reinventing gravitational lensing. Most lensing is "weak field" even around black holes. Unless you're using this term differently from Wikipedia's description of weak vs. strong lensing, I don't think that's true. Do the weak lensing approximations apply to the Einstein ring? Because that's the only way you'd see the supernova from directly behind the black hole. Edit: Ah, reading some more, it appears that Wikipedia's description of strong lensing is a bit misleading. It seems strong lensing is when photons loop around the black hole one or more times, and has nothing to do with whether the initial image happens to be a ring or not, yes? It is slightly confusing terminology, but all observable gravitational lensing takes place in the "weak field limit" basically because black holes are really small. Even with our best telescopes we can resolve their accretion disks and the "strong" fields would be inside of those. No the magnification isn't constant. It depends on the mass of the black hole, the size of the source, and all the distances involved. The d in that formula is given in terms of angular distances and the Einstein radius. Which in turn are determined partially by distances between the lens, observer, and source as well as the mass M of the black hole. Working M, d_L, and d_S back into the formula is what I meant by "redimensionalizing." Gravitational lensing is usually concerned with situations where these distances are constant and often even hard to figure out, so they try to remove them from the formula's and replace them with angular distances which are measurable. One caveat. Null geodesics are somewhat different from timelike geodesics, and actually these formulas may have to be adjusted. However, I think the adjustment would just be to reduce M by half. It wouldn't change any thing else. I think. The disc of the photon sphere is notably larger than the event horizon, and any light that hits the photon sphere is either absorbed or orbits and is re-emitted in a random direction. So are we certain that the light reaching the lee side of the black hole via gravitational lensing will have greater flux than the light blocked/redirected by the photon sphere? Yes, because the formula given is for the Einstein ring, of light that passes far enough from the black hole to be redirected exactly at the observer. I had a similar thought re: planar slice vs. a volume, like how a sphere takes up just a bit more than half pi/6 the volume of the smallest circumscribing cube while a circle takes up pi/4 the area of the circumscribing square. I'm not sure whether the ignored factors for... multiplicity? ...of the paths might change whether flux is higher or lower than without the lens; "above my pay grade," for sure. For the most part, light radiation and matter radiation should behave similarly, but when deflection becomes distinctly orbital, I suspect it starts becoming different. 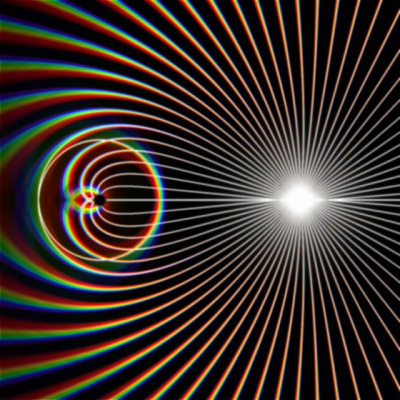 For one thing, the photon sphere has a sort of brittleness in the instability of photon orbits. I don't know, but I'm guessing it's because light can only orbit at the speed of light, so I think that means the only possible ellipse is the perfect circle, at the radius of the photon sphere. Normal orbital mechanics for falling toward a locally stable path don't apply when the orbiting body is not allowed to speed up or slow down; the slightest perturbation results in falling out of orbit, and capture in the first place might be a very rare thing since it requires the very close passing light be perturbed _just so_ by the subtle tug of something else that's just passing through, at a smaller radius than anything can be orbiting at for long. I've had intrusive thoughts about how, once we get into orbiting paths, the outgoing trajectory becomes much more sensitive to exact initial vector, and in a cyclic manner. For paths that loop around many times, does that sensitivity get to where subtle things like minimal uncertainty add up to chaos- by which I mean, deterministic results that nonetheless cannot be predicted or distinguished from perfect noise? For computational models, might numerical rounding and/or the noncontinuous range of "rays traced" produce artifacts kinda like the fun artifacts created by the regular polling of a camera and the periodic motion of a wheel? IF so, when the path is deflected to where the curve is not hyperbolic, should we call it a diabolic? P.S. I very much like the notion that the shielding goes on the far side of the source! That would be wonderful. Going from 1-space to 2-space to 3-space will probably makes the peaks and so forth a lot higher, but it'll be monotonic, so we can still see where the peaks and valleys will be. The circular-only orbit limitation is definitely the critical oddity in the difference between light and hot particles; otherwise you can simply extend the "event horizon" and "photon sphere" relative to the percentage of c at which the particles are moving. I'm guessing that a hot particle simply won't undergo more than 360 degrees of deflection? It would be really kickass to come up with a little program that would place a light source at the center and allow you to move one or more black holes of arbitrary mass around on the field, producing both an overlay of light paths and a false color or contour plot of flux. I'm guessing there are some neat multiples and orientations which could almost completely shield you. Is there a certain multiple of the Schwarzchild radius at which the light from weak field lensing reaches a minimum? That is, if the black hole is directly between the source and the observer, lensed light is at a maximum. If the black hole is, say, two radii offset from the line connecting the observer and the source, then a lot of the light that would be reaching the observer is being pulled away. Depending on the way the numbers fit together, it might be possible to use two or three black holes arranged radially around the line connecting the source and observer to "shield" most effectively. Then again, I have no idea whether this would ultimately result in less reduction than simply placing the shield on the other side. The Milky Way is a decently sizeable galaxy. Crazy to think that we are probably lensing for someone else right now. davidstarlingm wrote: The Milky Way is a decently sizeable galaxy. Crazy to think that we are probably lensing for someone else right now. Mousepup wrote: I had a similar thought re: planar slice vs. a volume, like how a sphere takes up just a bit more than half pi/6 the volume of the smallest circumscribing cube while a circle takes up pi/4 the area of the circumscribing square. I'm not sure whether the ignored factors for... multiplicity? ...of the paths might change whether flux is higher or lower than without the lens; "above my pay grade," for sure. Photons leaving the photon sphere do so chaotically, but there aren't enough to make much difference. The *total* radiation from all photons that go all the way around the black hole one or more times before reaching the observer is much less than what you get from the one outermost Einstein ring. So a supernova at 1 AU is nine orders of magnitude brighter than a nuke pressed against your eyeball. I thought "yeah I have a pretty good idea how much a billion times more power is." Then I realized something -- this means that the wavefront from a supernova is brighter than the core of a thermonuclear explosion out to 127 light years. Holy crap. Randal was right; it's always bigger than you think. Holy heck, the hydrogen bomb supernova thing is killing me. The inverse square law means we can move the supernova out half a light year and it will have the same energy as the flux through an eyeball of an h bomb at some negligible distance. What unit of H-Bomb are we talking? A tiny one? A huge one? A huge one that is a billion times larger than the tiny one Randall is talking about? Gah! I can't find any numbers on this kind of thing! And doesn't the inverse square law mean at a distance of zero, the bomb has...all? the energy? That doesn't make sense. I guess at zero it is the "base" energy of an H-Bomb and then you inverse square from there? Someone who is better at this type of thing, please help me out! 1 - By far, this is my favorite What-If ever written. 2 - As I read it again today, I saw a typo. I didn't see anyone had replied mentioning it specifically. And now, I can't stop seeing it. Plugging x into that equation returns 4.000243 Sieverts which matches the text, but not the answer to the equation. For what it's worth 4Sv or 5Sv, you're still going to die, and you'd still take that dose somewhere between Mars and the asteroid belt. "I witnessed a supernova and all I got was lethal radiation poisoning."